Turkey seems fond of so-called ‘false flag’ operations. In 1955, for example, the Turkish government covertly bombed its own consulate in Thessaloniki, Greece and blamed it on Greeks. The following day, Turkey stage-managed massive anti-Greek riots in Istanbul that killed over a dozen Christians and caused hundreds of millions in damage. Fast forward to March 2014. A leaked audiotape caught Turkish officials plotting to stage ‘false flag’ military attacks on their own territory and blame them on Syrians. Turkish Foreign Minister Ahmet Davutoğlu, General Yaşar Gürel, and Intelligence chief Hakan Fidan planned to use the attacks as an excuse to invade Syria. The title of this article could easily apply to that plot. To close observers of the Caucasus, however, it could also describe a failed covert Turkish plan to attack Armenia two decades ago and turn the geopolitics of the region upside down. In October 1993, two years after the USSR had splintered, an ethnic Chechen Muslim named Ruslan Khasbulatov – the Speaker, believe it or not, of the Russian Parliament – led a coup against beleaguered Russian President Boris Yeltsin. According to American, French, and Greek officials, Khasbulatov and Muslim Turkey had a secret agreement. If his coup succeeded, Khasbulatov would order Russian troops to withdraw from Armenia, where they helped guard the latter’s border with Turkey. That would pave the way for Turkey to invade the landlocked Christian nation of just three million inhabitants. History tells us that Turkey has always wanted to overrun Armenia. 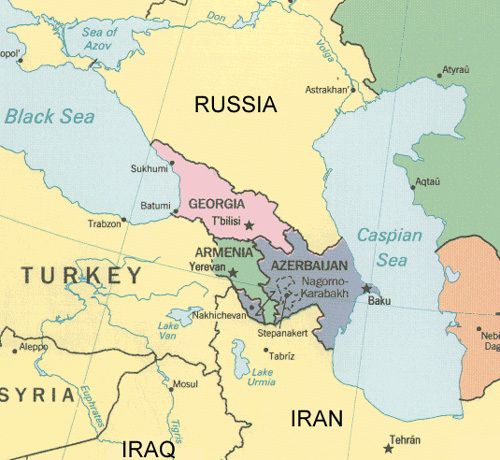 Doing so would create a path to Turkic-speaking Muslim Azerbaijan, the Caspian Sea, and, eventually, Central Asia. It’s called pan-Turkism. In 1993, of course, Azerbaijan was losing its war with Armenians over the ancient, majority-Armenian province of Karabagh. Azerbaijan was, therefore, eager for Turkey to attack Armenia, and Turkey was ready to help Azerbaijan turn the tide. Harkening back to the Armenian genocide, Turkish President Turgut Özal had threatened to teach Armenia “the lessons of 1915.” Tansu Çiller, Turkey’s prime minister, warned Armenia that she wouldn’t “sit back and do nothing.” Turkey was massing forces on Armenia’s western border and supplying Azerbaijan with weapons, military advisors, and paramilitary forces. Chechen militants and Afghan Mujahideen were already fighting alongside Azeris. A successful Turkish attack on Armenia – Russia’s only military partner in the Caucasus – would have all but destroyed Russian influence in the region. That, in turn, would have increased the likelihood that Chechnya, and much of the Muslim North Caucasus, would eventually escape the Russian Bear’s grip. For a native-born Chechen like Khasbulatov, it would all be a dream-come-true. But bombarded by Russian tanks, Speaker Khasbulatov, V.P. Alexander Rutskoi, and hundreds of rebel parliamentarians and supporters surrendered the Parliament building on October 4, 1993. The coup and the plot to invade Armenia had failed. The Khasbulatov-Turkish pact was first revealed by Leonidas T. Chrysanthopoulos in his book Caucasus Chronicles (London: Gomidas, 2002). He was Greece’s ambassador to Armenia from July 1993 to February 1994. Chrysanthopoulos, now 68, has served as ambassador to Canada and Poland, and was recently Secretary General of the 12-country, Istanbul-based Black Sea Economic Cooperation organization. France’s ambassador to Armenia, Mme. France de Harthing, told him that “French intelligence sources” confirmed that “the Turkish incursion into Armenia would take place immediately after Khasbulatov would have withdrawn the Russian troops from Armenia.” “This information,”wrote Chrysanthopoulos, “was later confirmed to me by my United States colleague,” Ambassador Harry J. Gilmore. The Turkish strike would be “incursions of a limited nature,” though it’s unclear what “limited” meant. More likely, as Turkey wouldn’t find any PKK, the aim was to forge a permanent corridor across Armenia, link up with Azeri forces, and cleanse Karabagh of Armenians. The U.S. and France have never, as far as is known, publicly denied the existence of the Khasbulatov-Turkish plot. Moreover, Chrysanthopoulos gives no indication that any country tried to talk Turkey out of its deal with Khasbulatov. Is any of this relevant today? Yes, because current Turkish, American, and NATO policies in the Caucasus strongly echo the 1993 Khasbulatov-Turkish plot. For two decades, the West has been trying to penetrate and dominate the Caucasus – Georgia, Azerbaijan, and Armenia –and eventually cross the Caspian Sea into energy-rich Central Asia. One piece of the plan has already been partially implemented: constructing oil and gas pipelines from Azerbaijan through Georgia and Turkey. NATO’s remaining goal: absorb the entire Caucasus. NATO would thereby threaten Russia from the south, just as it now pressures Russia from the west with its absorption of much of Eastern Europe (and, NATO hopes, Ukraine). Georgia and Azerbaijan are inclined to eventually join NATO. Armenia, however, is not, though it has excellent relations with NATO and the West. Armenia has little choice but to ally itself with Russia because the former faces an ongoing existential threat from NATO member Turkey, the 1993 plot being one example. Armenia is the Caucasus’s linchpin. Had the Khasbulatov – Turkish quasi-‘false flag’ operation against Armenia succeeded, Russia would probably have lost, and NATO would have gained, the entire Caucasus. New provocations, including ‘false flags,’ by Turkey and NATO cannot, therefore, be ruled out. Turkish, American, and NATO leaders must also be interrogated as to whether their policies in the Caucasus are leading to peace or war. David Boyajian is a freelance journalist. Many of his articles are archived at Armeniapedia.org. Read other articles by David. This article was posted on Wednesday, June 4th, 2014 at 9:15pm and is filed under Armenia, Azerbaijan, Caucasus, Georgia, NATO, Russia, Syria, Turkey, Ukraine.